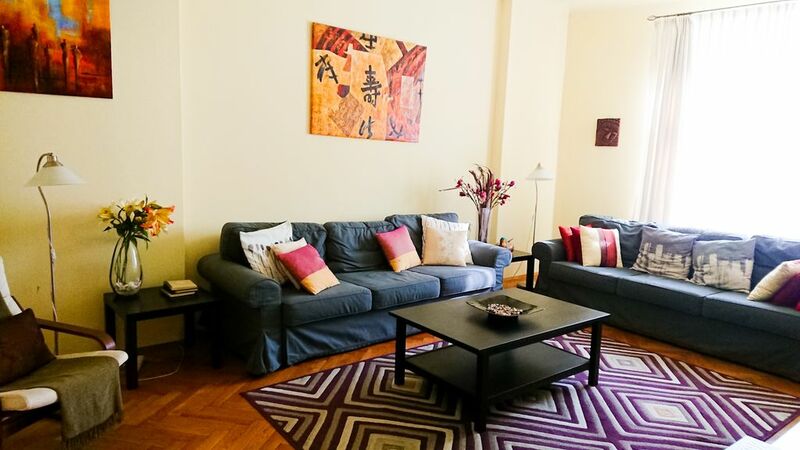 Our beautifully appointed apartment -in a building with elevator - offers the rare combination of space and elegance a mere stone's throw away from the magnificent Central Market Square, Krakow’s architectural jewel, and at a remarkably affordable price. You will love being close to restaurants and theatres, and stroll through Krakow’s cobblestone streets minutes after you set foot outside our apartment. Appointed in a contemporary style that takes full advantage of the sunny exposure in the morning as well as the sun streaming in during the afternoons and into the early evenings, our apartment has been completely renovated. We have, of course, preserved the 19th century oak wood floors throughout, and 10 feet/3 meters tall ceilings. The living room has two comfortable couches, which may easily be converted in additional and very comfortable sleeping space for up to three more guests. There is cable TV of course, including a choice of over 500 channels, as well as a CD/DVD player. And all throughout the apartment you have free and unlimited access to very high-speed Internet access by WiFi connection. We also provide you with a cellphone as well as a fixed phone, so you may be in touch with each other and loved ones elsewhere as you would back home. A fully-equipped kitchen awaits you, including a large kitchen island with breakfast bar, and a solid oak dining table that easily seats 8 people. The kitchen has all the modern amenities you expect, including a large refrigerator, microwave oven, full oven, water boiler, coffee maker, bread toaster, juicer and a number of additional items which make spending time in the kitchen area all the more pleasant. Your apartment has two bedrooms, a master bedroom with a double bed, as well as a second bedroom with two single beds). Both bedrooms are away from the street, so there is no noise to disturb your sleep. As said, a fifth, sixth and even seventh guest may be accommodated comfortably in the living room. The bathroom is beautifully appointed with tens of recessed halogen lights, and includes a clothes washer and heated towel rack for your convenience. We are child-friendly! This means that we have a crib/cot ready for you, including linen, as well as a high chair, and you will also find electric outlet plug-in covers waiting for you. Although we prefer a two-night minimum stay, we are very flexible. Our apartment is therefore ideal whether you wish to stay for a night or a month. Prices for longer stays are of course negotiable. It''s the wooden floors that did the trick. Those and the high ceilings. We love old houses, with each creaky floor plank and scratch on the massive wooden doors telling a story. After having owned this house for more than ten years we can truly say that it has good vibes - serenity, absolute quiet at night, and laughing schoolchildren on recess three times at day right behind the house. Tranquil, yet close to everything: it's a five-minute walk to the Main Market Square where you will find excellent dining facilities. Our apartment is veeery spacious, with tall ceilings, and has all the amenities you have at home (we mean that! ), including a fully equipped kitchen. You're a two-minute walk away form all the restaurants and sights. Central Market Square 5 minutes (7 if you're slow). We provide a landline for local and toll-free calls. Thick, quality towels. High-count cotton bed linen. Comforters for summer and winter. Blazing fast. Bring your own laptop or PDA and surf the Internet, check email. We have had one report of Mac-based devices not being able to connect, Caveat Emptor! First floor (UK) or 2nd floor (US). Brushed steel and solid oak, plus a kitchen island/breakfast bar. A range of international stations available. You have over 1,000 hours of music available to you, enough to listen non-stop for over 40 days without ever repeating a song. Many genres: Classical, Early music, Jazz, Hip-Hop, Rock, Rap, Folk, World, Latin, Bossa Nova, Samba, more..
Well located huge holiday home. Four adults 5 nights. Absolutely perfect would stay again. Thanks a lot. Very nice accommodations, convenient to the city center. We would stay there again. Best apartment rental we've ever booked. A family of 4 tall people (2m-176 cm) rented this apartment over Easter holiday, 2018. Knowing nothing about Krakow, we chose this property because of the location (on north side, near Stary Kleparz market, train, bus, and trams just outside the old part of town), separated bedrooms and separated twin beds and 2 sofa bed options (for teenagers who no longer tolerate sharing beds), full kitchen (many Polish services shut down over extended Easter holiday), washing machine, and lift (one of our party had an injury prior to the trip - all better now). The tall ceilings were a plus. The beds were comfortable and provided good rest. Extra comforters and pillows were available. Only 31-low stairs with various landings to the apartment, so the lift wasn't always needed at the end of the day. The full kitchen had all amenities desired, including full compliment of plates, bowls, glasses, cups, cutlery, tea, coffee (and filters), spices, coffee maker, electric water kettle, dishwasher, and plenty of counter space. Laundry soap/powder and one drying rack was also provided. Shower had excellent pressure, shampoo and body soap provided, and the extra long towels were a luxury. The owner, Caspar, and apartment manager, Sylwia, were very easy to work/communicate with, even arranging car pick-up to and from airport (our evening flight was delayed), saving us from figuring out the confusing train station, city streets, or negotiating rates with taxi while jet-lagged. The location was quiet and safe, with cash machines, a 24hr. store with food and personal care essentials, and good restaurants nearby. The apartment itself is clean and comfortable, and extremely spacious: A true apartment owned by a couple. It was a restful home retreat well situated in the city. The children appreciated the free wifi, the electrical converters were a nice surprise, and use of a local phone was a wonderful perk. We thoroughly appreciated the owner's non-smoking policy also. However, by raving about the apartment, I hope it will be available when next we venture to Krakow! We look forward to booking it again. Much appreciate the glowing review - had never thought about the importance of tall ceilings for tall people before, but that makes a lot of sense, in fact. You were great houseguests - come back any time!